The Shure SM7B – Magic Mic, or All Hype? Originally released in 1976, the Shure SM7B has become the stuff of recording legend. It was the mic that was used to record the vocals on the best-selling album of all time: Michael Jackson’s Thriller. It’s still the preferred vocal mic in the studio for many famous Rock vocalists. You’d be hard-pressed to find a recording forum without dozens of threads about the SM7B, and how every engineer should own one. The demand for these mics is so great that you’ll pay almost as much for a used one as you would to buy a new one. It’s also a somewhat quirky mic. First of all, its output is so low, you need a mic preamp with at least 60 dB of gain to get a usable signal out of it for recording! Also, because it was designed for broadcast use, it looks a little strange (compared to most condensers used for recording vocals) mounted atop a regular mic stand in the studio. And it looks even stranger (reminds me of a machine gun barrel) when you remove the foam windscreen (which many recommend doing). It’s also a fairly flexible mic. Being a large diaphragm dynamic, it’s equally at home on a bass amp or kick drum, in addition to vocals. Finally, it’s got some nifty EQ switches built in to the rear of the mic that let you tweak the frequency response curve of the mic before it even hits your preamp. So all of this begs the question–is this really a magic mic, or is it all hype? Speaking from the personal experience of owning and using one, and from reading dozens of forum posts and articles, here is my conclusion about the SM7B: it’s an excellent choice for home recording studios, or studios without adequate acoustic treatments. For studios with good acoustic treatment (and some decent vocal condenser mics already in the locker), the SM7B is not as appealing, although it can still have its place. Let me explain. Because the SM7B is a dynamic mic, it’s not overly sensitive like many condensers. It also has an extremely tight polar pattern and excellent off-axis rejection, and will capture almost no room ambience (unlike many condensers). It will pick up only what you put directly in front of it (and that’s after you’ve maxed out the gain on your preamp), and almost nothing else. This is why it’s such a great choice for home studios, and studios with poor acoustics. If you use a condenser in those settings, you’re bound to pick up lots of “room sound”, which will most likely affect your tracks in a not-so-good way. A condenser will also be more likely to pick up background noises (air conditioning “whoosh”, kids playing, cars driving by on the street, etc. ), whereas the SM7B will pick up little to none of that. On the other hand, for an engineer who has a well-treated room with good acoustics and minimal background noise, the SM7B won’t sound much (if any) better than recording with a decent-quality condenser. Also, if a studio’s mic preamps don’t have adequate gain, or if they get noisy when pushed to their limits, the engineer would either have to deal with the noise, or buy one of those “mic booster” gizmos that have hit the market in recent years, such as the Triton Fethead or Cloudlifter. 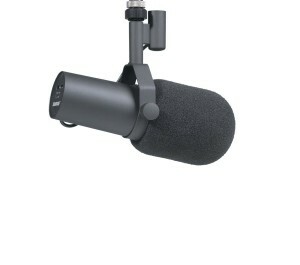 One of those gadgets adds about $100 to $150 to the cost of the mic, bringing the total price into the $450 to $500 range. You can get a really nice condenser for much less than that. In use, I’ve gotten decent results from the SM7B on vocals, but nothing that blew me away. In every instance, I’ve preferred the results I’ve gotten from a budget-priced condenser with a smooth frequency response. I also had to max out both the input and output gain on my mic preamp to get a usable signal with the SM7B, which starts to push the pre into some noisy territory. That’s not an issue with the condenser. I will admit, I recorded a particularly powerful female vocalist prior to acquiring my SM7B that nearly overpowered the condenser, even with the pad switch engaged, and I would have liked to have had the SM7B to try on her. But voices like hers have proved to be the exception, rather than the rule in my experience, and for her, I probably could have simply used another dynamic mic, like an SM58 or SM57, or even some other large diaphragm dynamic, such as one of my kick drum mics. In conclusion, if you’re a home recordist, or a small studio without proper acoustic treatment, or have nothing but uber-cheap, sibilant condensers at your disposal, I say go for it. The SM7B will deliver noticeably better results than what you’re probably using now. But if you’ve already got some decent mics and treatment, don’t expect it to be a game-changer. Still, some would say “you can never have too many mics”, and it never hurts to have different options available to you, so you might find that the SM7B is just the fit for a particular voice or instrument. To learn more about the SM7B, check out The Shure SM7B Story.